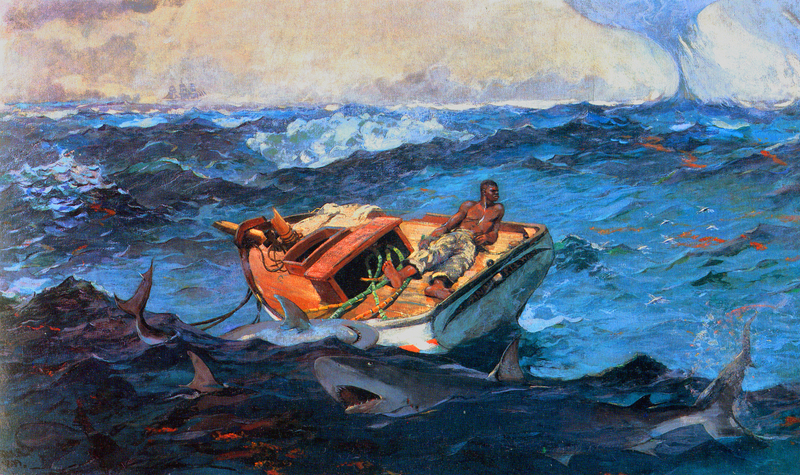 ….and some artistic views of it… let’s start with Winslow Homer. He captures just how I feel at anchor today. Luckily no sharks circling the boat just now, but otherwise these are pretty much the conditions here today. We are stuck in another cold front with strong westerly winds, a direction that makes it hard to find good protection in this part of the world. We are in Elizabeth Harbor on Great Exuma, but since it is a huge bay there is far too much room for wind and waves to build. We are yanking so hard on our anchor that it’s hard to imagine either the anchor or the bow of the boat surviving this without damage. I have made references to words for wind almost every time I have talked about sailing. As I’ve said many times, ‘zephyr’ is my favorite wind word, and I’d really rather not sail in anything but a zephyr. We haven’t seen a single one this winter. One of the first things I learned about words when I began studying them, is that if there is not a word for something, like oak tree, in a language, that’s a sure sign that no oak trees grow where that language is spoken. Duh! And of course the opposite is true! If there are 30 words for wind in a language, you can bet they have a lot of wind. Like the Inuit and words for snow. I have no idea which language has the most words of wind. I remember hearing that ancient Greek has 30 words for it… maybe that was just a catchy phrase in Greek courses in the 70…but it has stayed with me for four decades. I am utterly tired of the wind this winter. It’s been spring for three weeks now, but we are still having these winter cold fronts down here with strong winds. Bob just heard from his weather router this morning that there are at least two more weeks of this clocking wind headed our way. 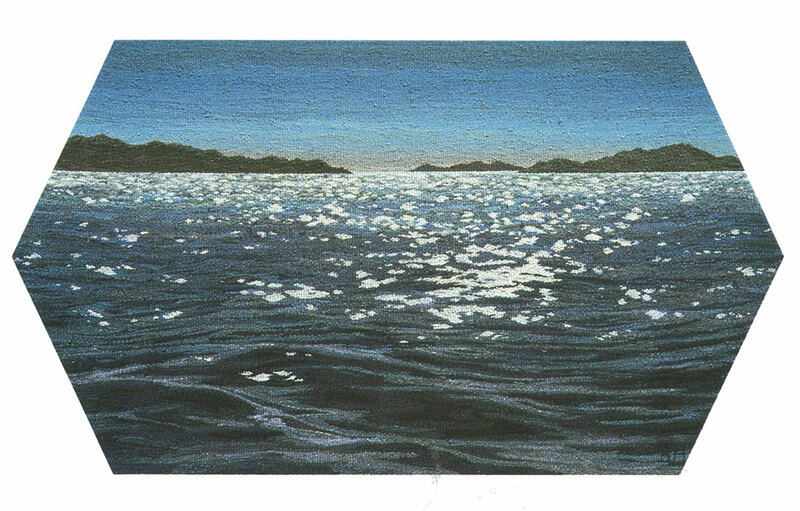 Here is Sarah Swett’s marvelous “The Hut on the Rock, the Sea.”…. look at those calm waters!…..look at that lovely coracle!…..it’s hard for me to imagine a more idyllic time on the water than this. I haven’t experienced a moment like this in so long I cannot remember. And here is Barbara Heller’s “All the Diamonds.” She’s done a beautiful job rendering the brilliant points of light on water …..again not something I’ve seen in a while since it’s always blowing a gale here. 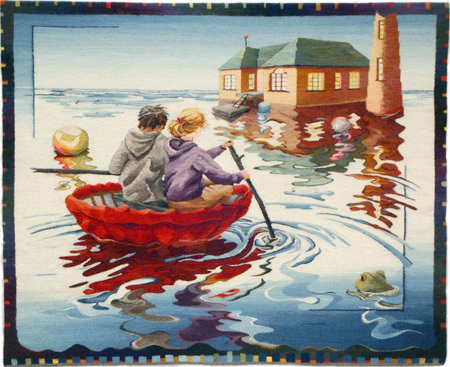 Best of all, this tapestry by Sarah Swett depicts my idea of a perfect day: my feet firmly planted on dear Mother Earth, admiring the lovely water view….while knitting! What could be better? It’s inspiring to see what a couple of wonderful artists can do translating lovely moments on the water. I just have to cling to the belief that there might times like this ahead for me. 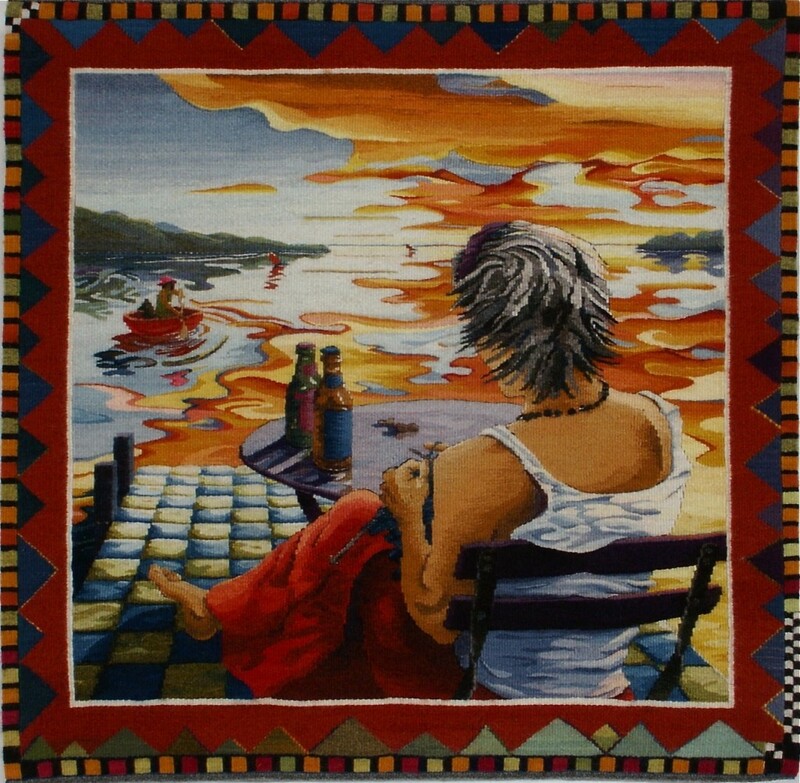 This entry was posted in inspiration, sailing, tapestry, Uncategorized. Bookmark the permalink. Pleasure meeting you today anchored next door in Rock Sound Eleuthera. Funny; your boat name, Pandora is the name of a former kitty of mine. Zephyr, your favorite word for wind, was the name of a golden retriever I used to have. His brother was Neptune, and if ever I got a third dog, I was going to call him Apollo. (I’m relatively new to sailing but names the dogs when I used to be an avid windsurfer). Anyhow, smooth sailing to you and we hope to cross paths again in the not to distant future.